After driving by this airplane in George Izay Park on Olive Avenue for years on my way to work, I decided I should try and at least find something out about its origin. As it turned out, historical details are somewhat sketchy. The Lockheed Corporation started in California in the early 1900s and was relocated to Burbank in 1934. In 1984, Burbank Mayor Daniel Remy wanted to honor one of the city’s long time employers, so he paved the way for a Lockheed F-104D-15-LO Starfighter jet monument to be placed at George Izay Park. 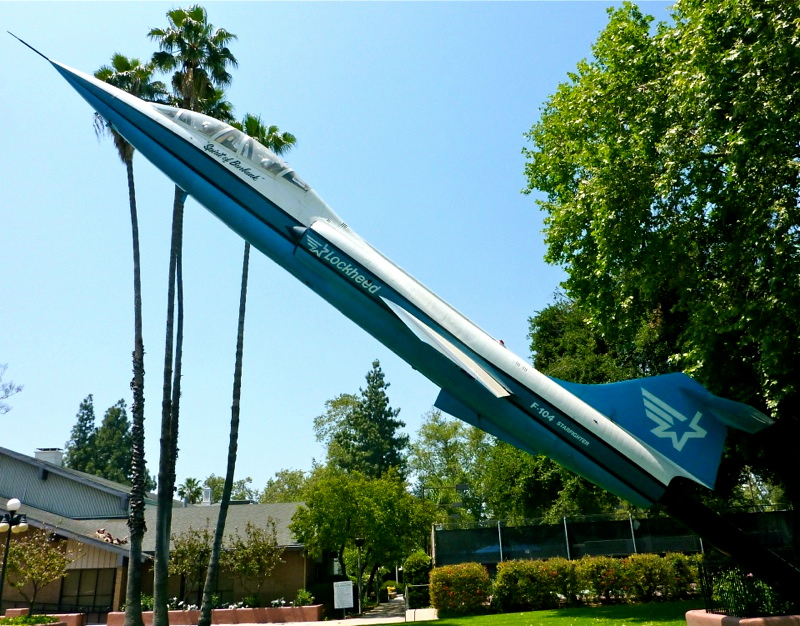 Burbank city officials have often been angry at the cost it takes to maintain the jet, but even back in 1987, Councilwoman Mary Kelsey said, “The Air Force is very particular about the way we treat that plane. We have to take a picture of it every year and fill out a form that shows we’re taking care of it.” There are disputes about whether the city had to pay for the plane or not. Some claim it cost $25,000, but Remy said Lockheed donated it. On September 25, 1984, the park was dedicated and renamed after George Izay. Izay worked for the Park, Recreation and Community Services Department for over 28 year; the last 21 of those years in the capacity of Department Director. Under his direction, the Department initiated several impressive programs. In any event, not everybody gets to catch a glimpse of an airplane on the way to work.